This lovely village hall now looks even better with it's new roof. MT Roofing and Scaffolding were proud to have been asked to complete the job and help keep this wonderful, much used community facility in good condition so it can continue to be used for years to come. 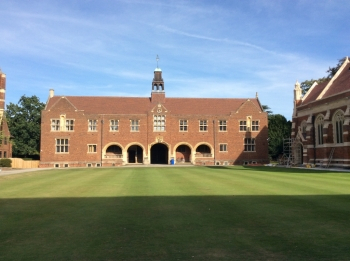 MT Roofing and Scaffolding at the Leys School in Cambridge where we were required to scafold and re-roof this beautiful building. 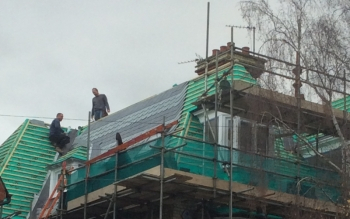 New slates, leadwork and ridgetiles supplied and fitted on new battens and membrane. 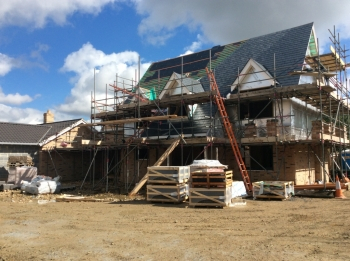 This local development in Impington, just outside Cambridge, comprises a number of houses and bungalows and MT Roofing provided all the scaffolding and roofing for the project. 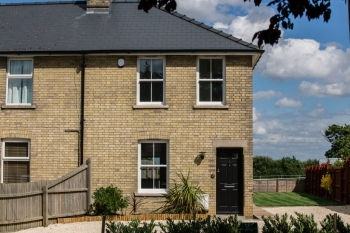 Using a range of roofing materials and skills we worked with the developer to install the roofs and valleys and clad dormer windows. 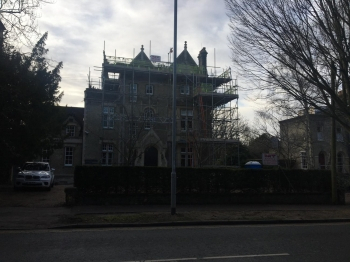 Another specialist job for MT Roofing and Scaffolding at the Leys School in Cambridge where we were required to erect scaffolding around one of their towers to enable maintenance to be carried out. This complex installation allowed the contractors to clean, paint and repair the tower in a safe and secure environment without damage to the building or grounds. This semi-detached house in Swavesy was recently modernised and MT Roofing were happy to be appointed roofing contractor for the project. 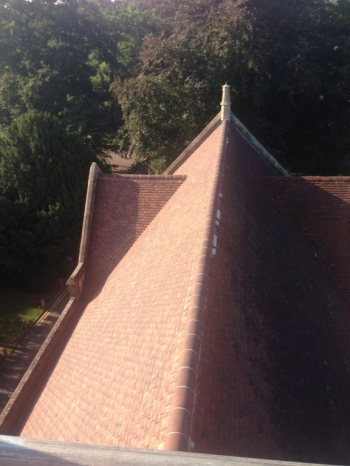 We supplied scaffolding and roofing materials and stripped and re-slated the roof and leaded and repointed the chimney. 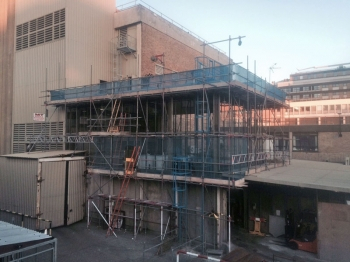 Addenbrookes hospital in Cambridge neededus to erect some scaffolding for them when a falt roof needed repair. Working on a hospital site requires skill and consideration so that disruption is minimal and we are happy to have been able to supply the scaffolding. Project: Scaffolding to enable repairs to a flat roof. 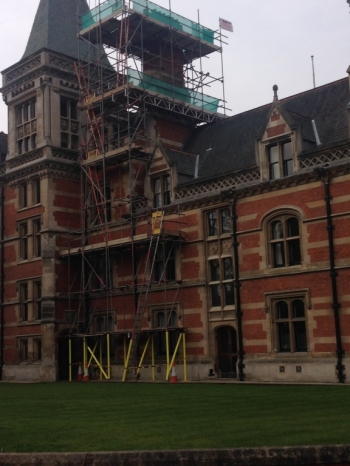 MT Roofing & Scaffolding were very pleased to be able to supply and erect this scaffolding for Cambridge University. 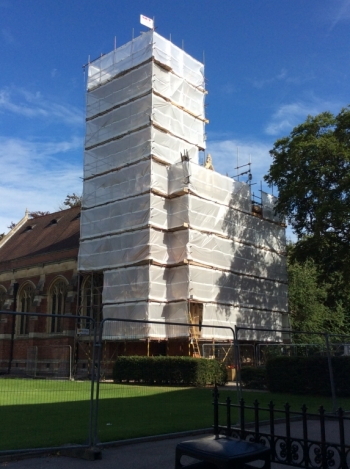 They needed the scaffolding so that routine maintenance could be preformed on a chimney stack on this fabulous building. Working with older buildings presents many issues but MT are able to work in partnership with the building owners and managers together with the mainatenance contractors to ensure the whole process is safe, secure and as least disruptive as possble. MT look forward to further roofing and scaffolding projects with the University in the future and will publish details of our projects as they are completed. 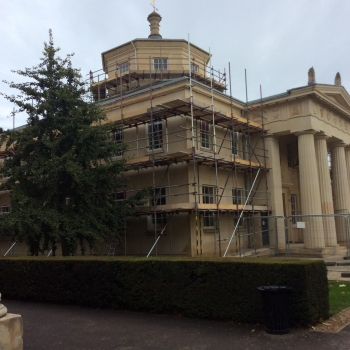 When you need a Cambridge scaffolding contractor with years of experience who has worked on numerous large and small scale projects, MT Roofing and Scaffolding, Cambridge is the answer. Take a look at the extensive range of scaffolding options we can help you with and contact our Cambridge office to quote for your scaffolding needs. 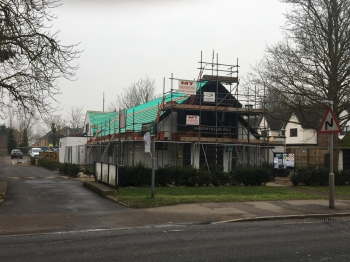 MT Roofing and Scaffolding, Cambridge have been installing, repairing and renewing roofs in the Cambridge area for many years. 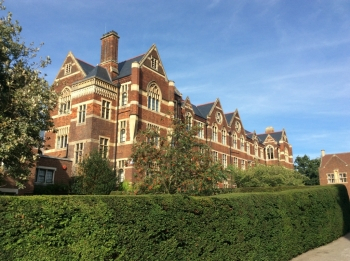 Our vast satisfied client list includes Cambridge University colleges, local schools, homeowners, large and small businesses and many of the builders and building companies in the Cambridge area. 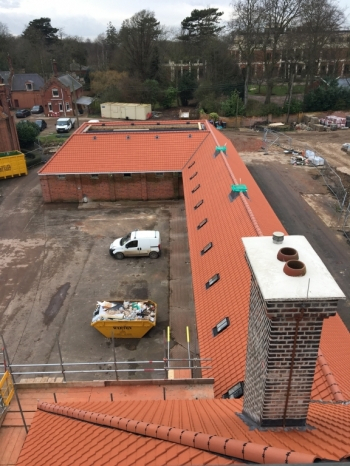 We will happily cater for all your requirements with our substantial range of roofing services so let us quote for your Cambridge roofing project. 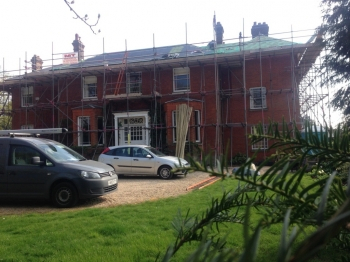 MT Roofing and Scaffolding, Cambridge are your one-stop shop for all your scaffolding and roofing requirements. 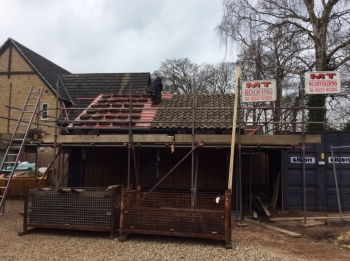 Established in 1983 and repairing roofs and supplying scaffolding all over the Cambridgeshire area, we offer scaffolding services, roofing materials and roofing services. 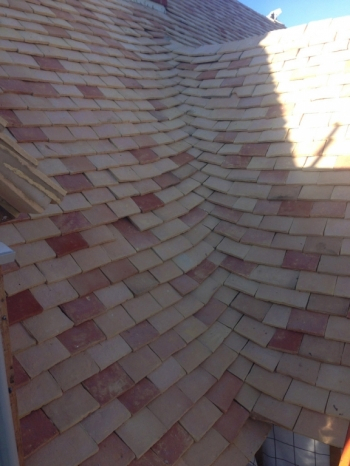 The sale of salvage tiles, slates, chimneys, ridge tiles and finials. If you would like to know more about our services please click here to contact our Cambridge office and we'll get back to you as soon as we can.